Inferno: The Epic Life and Death Struggle of the USS Franklin in World War II by Joseph A. Springer - Jimmie Aaron Kepler, Ed.D. Joseph A. Springer sets the standard for how oral histories should be written with “Inferno: The Epic Life and Death Struggle of the USS Franklin in World War II”. You feel as if you are on-board as the story of “Big Ben”, the USS Franklin, in World War II unfolds. It is necessary read for anyone who claims to be a World War II history buff. The book divides into two parts. The ship’s change of commanders is the dividing point – Captain Shoemaker’s command and Captain Gehres’ command. It is a well-structured book. It starts with the specs and construction of “Big Ben”. It takes us through the training of the crew and shakedown voyages. We travel through the Panama Canal to San Diego and on to Pearl Harbor laying all the appropriate groundwork along the way. Mr. Springer takes great care in organizing and selecting interviews. You are in the aircraft cockpits experiencing the words and emotions of the men who lived through the survived the events. The stories are breath taking eyewitness accounts and survival stories. He manages to get you inside the heads of the pilots and ship’s crew. You feel the fear and experience the heroism. The USS Franklin’s size and importance led to one of the Navy’s first encounters with Japan’s Kamikaze attack planes. The suicide pilots delivered terrible damage to “Big Ben” in October 1944 off the Philippines. The damage forced Big Ben back to Bremerton, WA for repairs and a change of command. In March 1945, “Big Ben” experienced the devastating bomb attack off Honshu, Japan. That attack defined her crews’ extraordinary valor. Somehow, they saved the ship. “Big Ben” traveled back to New York. She was rebuilt, but would never be the same. Mr. Springer makes good arguments to restore the entire crew of the USS Franklin’s honor. You learn how the spiteful and hateful actions of her second captain attempted to segregate the crew into two groups. Group one was the sailors and airmen that remained on board during the entire ordeal. Group two was the person who did not stay onboard for the entire ordeal. Unfortunately, Captain Gehres made no differentiation for those who may have been blown overboard by exploding ordnance, forced off due to flames and heat, removed to a rescue vessel as a result of injury or simply because they were ordered to abandon ship. Joseph A. Springer wins the argument that All Hands of the USS Franklin were the real heroes of this gut-wrenching ordeal and fight for survival. This includes those on the rescue vessels. The book gets my highest rating. It has excellent photographs, maps, illustrations. The reference material at the end of the book will make ever the most critical historian smile. Buy the book. 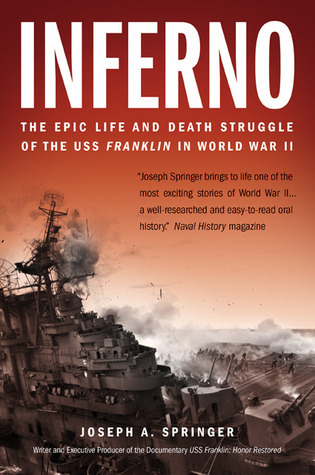 “Inferno: The Epic Life and Death Struggle of the USS Franklin in WWII” is an excellent book.